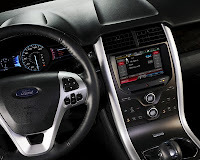 A Ford screenshot showing the current state of the art when it comes to in-car technology. Over the next five years, though, hardware and software are likely to be integrated, making a wide variety of cloud- and sensor-based applications possible. But safety must still come first. (Credit: Ford). I have seen the future of computing technology in cars, and it's not coming any time soon. It is coming, though, and when it arrives, it may very well change the way we deal with information while we're driving. But because the auto industry moves at a truly snail's pace when it comes to innovation, it's likely to be at least five years before this vision comes to pass. My view into this future came from a conversation I had at the South by Southwest Interactive (SXSWi) festival with T.J. Giuli, a vehicle software systems engineer in Ford's Infotronics Research and Advanced Engineering division.